This fall trends on men’s makeup span from the sleek and polished male to the masculine professional, and let us not forget the independents (if you will). As a makeup artist, I find all trends extremely interesting. I encourage you to make them your own. The old Hollywood male 2012 trend for men’s grooming and makeup comes from the sleek and iconic film stars of the fifties. From Frank Sinatra’s clean fresh complexion to the fine details of James Dean’s brow, the look is clean, classic and distinguished. Giorgio Armani made an impact with his fall 2012-2013 collection. Strong structure in his designs with masculine layers, made fresh healthy skin the perfect complement for runway and real life. Clean, classic and attractive. Here are some amazing photos from the 2012-2013 Giorgio Armani men’s collection. Notice the strong brows and hydrated skin. There is a slight use of bronzer around the temple and forehead area. This is completely acceptable for all seasons. We recommend Nars Laguna Bronzer, and to even skin try Nars oil free SPF Tinted moisturizer. This tinted moisturizer is available in array of shades made to smooth, and evens the texture of the skin. Another designer this fall who put an emphasis on the male classic complexion was Dsquared2. Dsquared2’s designs are magnetic and interesting. The makeup used for this collection was still sheer with a slight dewiness around the eye and lip balm for smooth hydrated lips. Masculine yet polished. The Dsquared2 male attracts attention. 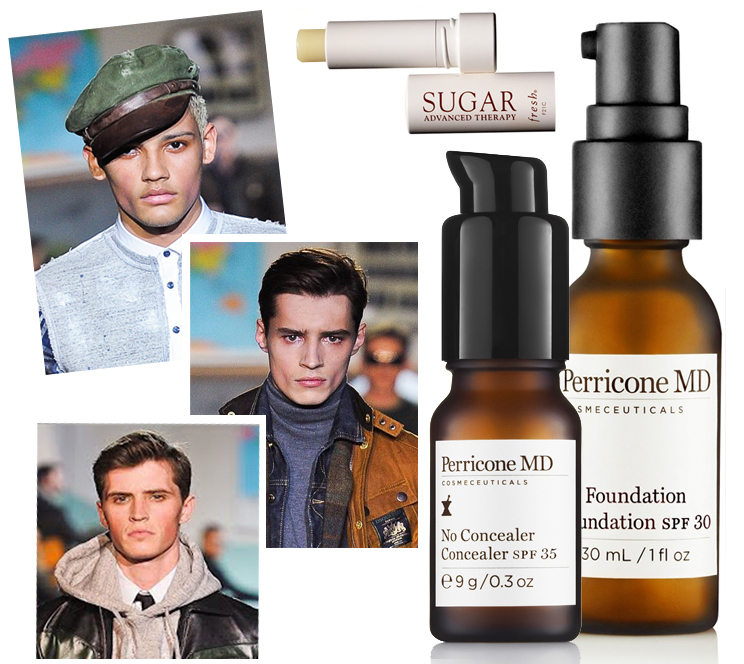 To get this sheer yet flawless skin I would suggest Perricone MD No Foundation Foundation. The companion product by Perricone MD is, No Concealer Concealer. Both products will effectively conceal flaws without the messiness of foundation or concealer. For smooth lips try the Fresh Anti Aging Lip treatment. Essential to keep your lips smooth and hydrated. 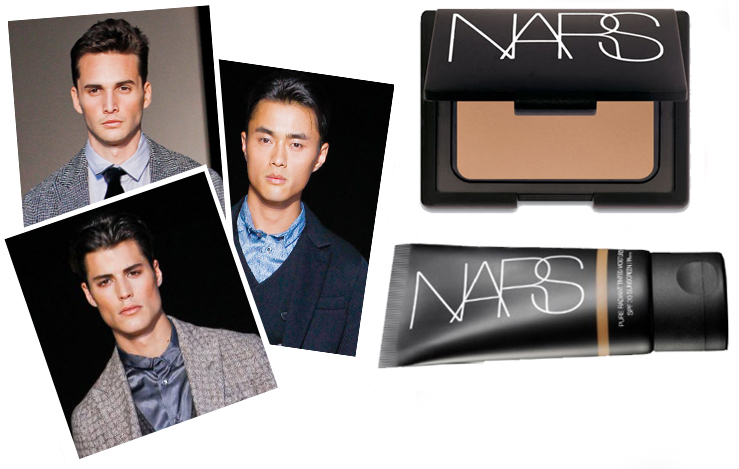 And the conclusion of my overview of men’s makeup on the runway is the rebel. The outstanding brand that I am referring to is Diesel. Diesel Black and Gold doesn’t follow the rules and that is what makes them so magnetic. Every piece that was presented on the runway was unique. There were sleek suits and edgy urban ensembles as well. The makeup was more matte and hair had no limits. To get this complexion try Smashbox B.B Cream. and Smashbox HD setting powder. Perfect for any skin type . 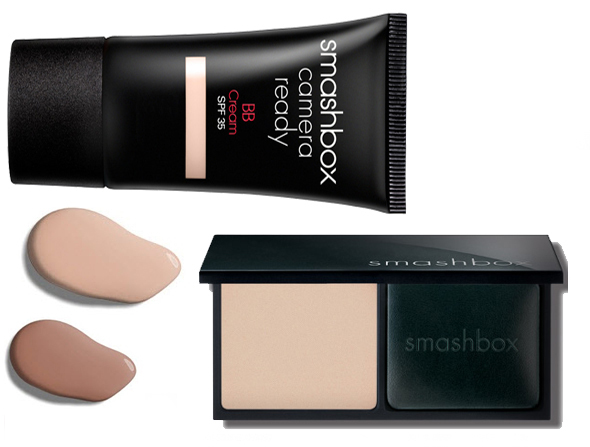 The Smashbox B.B. Cream evens the skin and protects with spf 35. The Smashbox HD powder can be used alone on bare skin to control shine, or lightly layerd over the B.B. cream. The packaging is sleek, modern and easy to travel with. Enjoy fall and please try out this to be on trend!